Found roughly half way through our 6×36 stainless steel wire rope range in terms of diameter, this 26mm product will be an ideal match for outdoor and marine lifting tasks. Composed of either a steel or fibre core, this corrosion-combating 26mm 6×36 stainless steel wire rope can stand the test of time. The independent steel wire core for this 26mm stainless steel rope will be essentially identical to the bundled strands woven around it, providing great strength and superior load lugging power. It gives the rope a 38,515kg capacity; a little above the 35,702kg of its fibre core cousin. Fibre is lighter than steel, while also being suppler. These factors could come into play in certain operations, it simply depends on your needs. If you are having trouble deciding, use our contact details below to get in touch and Rope Services Direct will point you in the right direction. Wire rope is abundantly available from our site, alongside a laundry list of alternative options. You can order natural fibre rope, lifting gear, balustrades and even the tools that are used to complete our wire rope assemblies. Our prices are competitive, you can order rope in any length and you will always have control over the fittings it is supplied with. 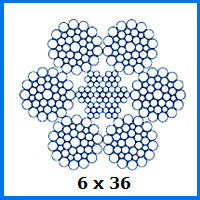 Got a query about 26mm 6×36 stainless steel wire rope? Hit up the RSD specialists by calling 01384 78004 or heading to our contact page where our email form is found. We promise to reply promptly to any questions we receive. 26mm 6x36 Stainless Steel Wire Rope Overall rating: 5 out of 5 based on 6 reviews.